The pedestrian plazas in front of Hunter GO Station were being used for transit security parking but have now been restored for use by people on foot and bikes. 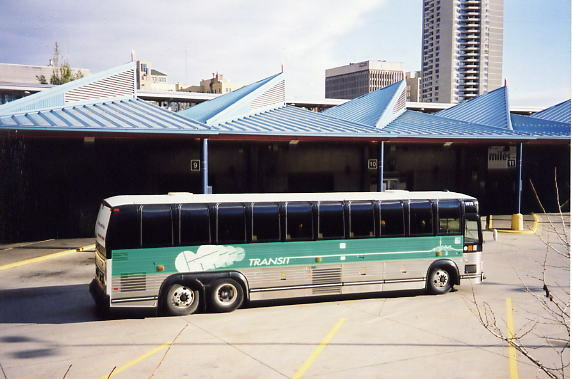 People who are users of the Hunter Street GO Station may have noticed that the "Special Constable Transit Safety" automobiles are no longer being driven on the pedestrian plazas and stored there. This space has been given back to the people of Hamilton, and bicycle parking has been installed. In 2016, the pedestrian plazas on both the East and the West side of the Hunter Street GO Station started to be used for automobile storage. At least one formal, written complaint was made to GO Transit about people being bullied and intimidated by car drivers on the pedestrian plaza. I know, because I made that complaint myself. GO took action. Now, the "Special Constable Transit Safety" automobile storage is in the bus bays behind the station. The plazas have been restored for use by the people of Hamilton. To make absolutely sure that automobiles can no longer be stored on the plazas, new bicycle racks were put in the same places for extra bike parking for all the people of Hamilton to use. Now that's another small win for the people of Hamilton! East pedestrian plaza. The area in the yellow stripes was used for automobile storage. West pedestrian plaza. The area in the yellow stripes was used for automobile storage. Automobile storage is now behind the station, in the bus bay area. I love that station. It use to have a much wider track bed in the past. I wish they had rebuilt it to its original 8 track bed TH&B glory (4 tracks for station platforms, 3 tracks for a coach yard and a spare locomotive service track), instead of the current 3 track configuration. That would have given a lot more room for bus bays and vehicle storage underneath the track bed. It probably would have given more weight to make the case for widening the tunnel leading to the station as well as allowing for more GO Train capacity but that is just a dream now. It's still a wonderfully restored station, one of my favorites! Re: "more room for bus bays and vehicle storage underneath the track bed"
Maybe, maybe not. Notice the thickness of the concrete slab behind the bus that is supporting the track bed. There may not be enough clearance for a bus to fit underneath it. Lower the floor/ground, while you underpin the supports for the track bed structure so there is more room. Unfortunately, what's done is done and that extra track space has been gone since the 1950's and 1960's. Fun fact that has been mostly lost in all the LRT hoopla over the past several months: Hamilton will get two-way, all-day GO train service to Hunter GO station in time for the LRT line to open in 2023-4 - at least a few years before we get two-way, all-day GO train service to West Harbour. The reason for this is that Metrolinx has to negotiate with the private owners of our rail rights-of-way to secure access for GO train service. CP owns the old TH&B line that serves Hunter, and CN owns the line that serves West Harbour; and Metrolinx has had more success negotiating with CP for all-day access on its line. That means Hamilton will have all-day GO train service to Hunter Station, directly serving the heart of the downtown core, in time for our LRT line to start. With the high-order pedestrian walkway on Hughson for the couple of blocks between the Gore Park LRT station and Hunter, the B-Line will connect directly to regional rapid transit - a key condition of rapid transit funding under the Moving Ontario Forward fund. This news should make Councillor Skelly very happy. Wasn't she calling for better GO transit service during this last LRT debate? As part of an alternative to the LRT? Despite the fact it's old news, from April 2015... news when she was still in the, um, news business at CHCH before being part of the unfortunate mass termination in Dec 2015. Which is why I described this as a "small win" for the people of Hamilton. The LRT vote was a big win, for which Ryan and everyone else who fought for this deserve a great big "thank you!" Now that we've got the LRT win under our belt, we can move on to other things. Some will be big and some small. But all the small wins do tend to add up. A few years a go, the Mayor of Buffalo made a comment that he would like GO Train service to his city. This was when GO Transit was first talking about implementing its RER Plan. The Mayor mentioned the old TH&B and how with the growth of Toronto, Buffalo and the rest of the Niagara Frontier was more economically and culturally linked to southern Ontario than the rest of New York State. By association he saw that a commuter rail connection to the rest of southern Ontario was in his city's best long term interest. That CP line to Buffalo passes right through Hunter Street Station. The professional side of me knows that the reality of a GO line to Buffalo has a pretty slim chance of ever happening but, it does feel quite natural for me, regionally speaking, to have a GO Train line that starts in Toronto passes through Hamilton on its way to Buffalo. There is a good business case for this - especially for Hamilton. As an engineering firm with most of our work between Hamilton and Fort Erie - we specifically avoid Toronto - we have a much stronger connection with other firms, contractors and businesses in Buffalo than elsewhere in Ontario. Perhaps what makes sense and is doable is 2-3 more GO stations on the old TH&B line in Hamilton and Stoney Creek to the East of the Hunter Street GO Station. Normally, one does not want GO stations to be too closely spaced as bringing the train to a stop wastes the time of every passenger who is not boarding/departing. But at the end of the line there are very few passengers. This would allow for people to travel to downtown Hamilton from outer Hamilton or Stoney Creek. I started to write more, then realized that I was working up a full-scale proposal that would be more suited to be an article than a comment. "I started to write more, then realized that I was working up a full-scale proposal that would be more suited to be an article than a comment." Yes, thank you for your comprehensive article about a complete rail-based transportation network in Hamilton. What I had in mind to write about was not a complete and comprehensive system, such as your excellent proposal. But merely an incremental upgrade of the existing and currently planned GO service along the former TH&B line. Also, you wrote about your proposed network acquiring its own rolling stock. I am looking at using the existing GO rolling stock, and merely extending the existing GO route a little further to the East. Your network has stations spaced at regional rail spacings. I am looking at LRT spacings of 1-2 km to provide a local service East of Hunter Street GO Station. But it was good to look at your article again! It is very important to think "big picture" about transportation in the entire region. If you were actually going to have GO Rail service a la Toronto-Hamilton-Buffalo. Hamilton would have to act as a sub-centre to majority of the train service. Due to the large number of stations already existing between Hamilton and Toronto. The old debate of vertical vs. horizontal expansion of any rail line comes into play here. I would see 2 out of 3 peak hour train runs ending and turning around at Hamilton with stations at Stoney Creek, Smithville , Welland, Fort Erie and Buffalo. 1 in 3 trains would be express or a limited stop express service to Toronto Union. This is assuming, the owning railway wanted this to happen at all and we could work around its freight schedule, Transport Canada doesn't have issues with the run and possible interference at the Welland Canal (which is one of the present sticking points with the GO Line service to Niagara Falls), how we get around customs/border issues and make sure that several big existing infrastructure deficits that exist on the run can be expediently dealt with (lots and lots of money). Oh yes, solving the growing problem of Union Station's ever shrinking amount of spare train holding capacity (a new downtown Toronto Station at the North Bathurst Street GO Yard is still seriously being considered).